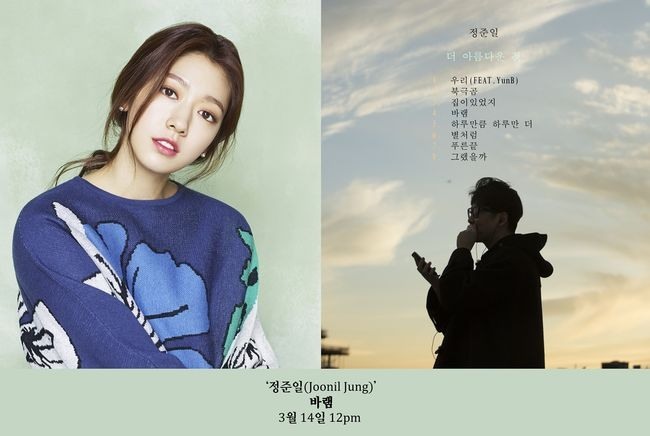 Park Shin-hye will feature in balladeer Jung Joon-il’s new music video, Jung’s agency said Monday. Park will play the lead in Jung’s song “Baraem,” the main track of his third album. Jung will appear in the clip too, which is a rare decision for him, according to MyMusic Entertainment. The Korean word “Baraem” can be translated into wish, hope and desire. The new eight-track album will be released on March 14. Park finished shooting for a new movie, “Silence (working title),” in early February.